May 19, 2016 -- Links International Journal of Socialist Renewal reposted from Pambazuka News -- In recent weeks, news of food crises in countries across Africa has been intensifying. From the Democratic Republic of Congo all the way down to South Africa – via Malawi, Zimbabwe, Angola and many others – low rainfall has contributed to millions more being left vulnerable. For more on Thomas Sankara and Burkina Faso, click HERE. February 9, 2015 -- The Bullet, submitted to Links International Journal of Socialist Renewal by Ernest Tate -- A press report in 1983 that a popular uprising in Upper Volta, a small and poor land-locked country in Western Africa, had led to an obscure, but charismatic army officer becoming head of state was truly inspiring news for all those looking for some kind of breakthrough against imperialism in that part of the world. It had come after the depressing news that Margaret Thatcher's Britain had defeated Argentina in the Malvinas and Ronald Reagan's USA had crushed Grenada, a clear message to the world that, on a moment's notice, imperialism would brutally crush anything that threatened its power. But because the US empire had been taken by surprise by the Cuban Revolution 24 years earlier, many of us were then hopeful that maybe we were witnessing such a possibility again, in Africa. For more on Burkina Faso, click HERE. December 9, 2014 -- African Futures, submitted to Links International Journal of Socialist Renewal by the author -- Even the long months of demonstrations and strikes that came before did not fully prepare the people of Burkina Faso for what they would accomplish during the last week of October 2014. In Ouagadougou, the capital, hundreds of thousands—organisers claimed a million—packed the central square on Tuesday, October 28, to protest President Blaise Compaoré’s “constitutional coup”, as they called his plan to force through an amendment enabling him to run for reelection yet again, after more than a quarter century in power. 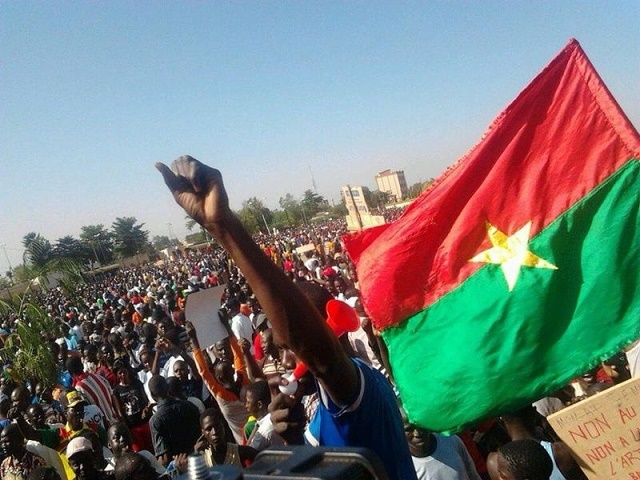 November 3, 2014 -- Ceasefire, posted at Links International Journal of Socialist Renewal -- An incredible political transformation has been taking shape in the "Land of the Upright or Incorruptible People", Burkina Faso. Twenty-seven years after the assassination of revolutionary leader Thomas Sankara, Burkinabés turned out in their hundreds of thousands, for several days of protest, chanting “trop c’est trop” (enough is enough), echoing in the process a long history of trade union activism against political repression in the country, as well as protests staged through the Balai Citoyen collective. For more on Thomas Sankara, click HERE. 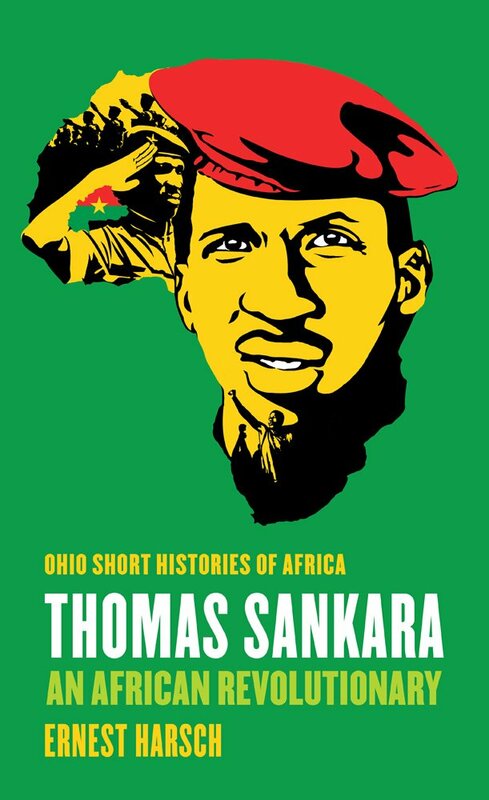 October 10, 2014 -- New Books in African Studies --Thomas Sankara, often called the African Che Guevara, was president of Burkina Faso, one of the poorest countries in Africa, until his assassination during a military coup that brought down his government. Although his time in office was relatively short, Sankara left an indelible mark on his country’s history and development. Thomas Sankara meets Fidel Castro. August 15, 2014 -- Think Africa Press -- In 1987, Blaise Compaoré overthrew Sankara and took over the presidency. 27 years later, Sankara's ghost may be coming back to return the favour. Thirty years ago, on August 4, 1984, the former French colony of the Upper Volta was re-baptised as "Burkina Faso" amidst a revolutionary process that proved to be one of the most inspiring, yet ultimately tragic, episodes of modern African history. In 1983, the young Captain Thomas Sankara had come to power in a popularly supported coup d'état and − with broad support from leftist political parties, students, women and peasants − initiated a range of ambitious projects, including the country's name change, that aimed to make the country more self-reliant and free of corruption. Sankara also sought to decentralise and democratise power in order to facilitate more participatory forms of governance, though elections for national offices were never attempted. Thomas Sankara was killed in the belief that it could extinguish the example he set for African youth and progressive forces across the continent. They could not have been more wrong. One week before his assassination on October 15, 1987, in a speech marking the 20th anniversary of the assassination of Ernesto ``Che'' Guevara, Thomas Sankara declared: ``Ideas cannot be killed, ideas never die.’' Indeed, the history of humanity is replete with martyrs and heroes whose ideas and actions have survived the passage time to inspire future generations.